Money’s tight for many – us included! In our day-to-day activities RancherMan & I are always looking for ways to do what we do without spending unnecessary money. I’ve always been pleasantly surprised at how easy it is. But it’s true, you do have to keep your eyes open to be aware of options. But once you get into that mindset it’s quite natural to do things in a way that makes the best use of the cash you have available to you. I thought it would be fun to share 5 Frugal Things we did this week that shaved a little cash off our budget. I like yogurt. A LOT! And RancherMan enjoys having yogurt sweetened with Homemade Pear Preserves for breakfast too. 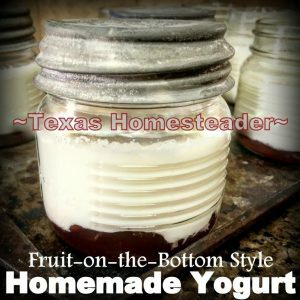 So I typically make homemade yogurt about once a week. (Thankfully my recipe makes a 1/2 gallon of yogurt!) Making what I used to buy always saves money. Plus I make it in 1/2-pint canning jars so we have that single-serve convenience without the waste – the jars are washed and reused over & over again. A triple win – health – finance – environment! My folks live pretty close to us, so we try to get together with them whenever we can. Oftentimes that means getting together at a restaurant. There’s nothing wrong with that, y’all!! But when money is tight, you plan gatherings that don’t cost quite so much. A dear friend went deep-sea fishing and gifted us some beautiful thick tuna steaks. RancherMan fired up the grill and cooked them in no time. And I roasted a medley of fresh veggies for a healthy side. Dessert was a quick tortilla rollup using pie filling & tortillas. And we all enjoyed gathering & bonding once again as family. We’re planning a great trip to the beach. But we only have one easily-transportable folding chair. As RancherMan & I discussed buying a second one, we instead decided to see if we could borrow one instead. I mean this other chair wouldn’t really be used after our trip. It would be just a waste of money and a waste of storage space. A quick phone call confirmed it – a folding chair was available for us to use. YEA! RancherMan & I love raising chickens. They are fun to watch, they’re great bug eaters and they offer the most nutritious eggs ever! We do feed them layer pellets and make sure they have oyster shell to keep them healthy. But hens naturally slow down their laying in winter months. And of course there are no bugs for them to eat either. Plus in the dead of winter, every predator is licking their lips over a chicken dinner. So we buy young layers each spring and then sell them in the fall. We get lots of fresh eggs, plenty of bug control and great entertainment all summer long. Then in the winter we’re not tasked with keeping/feeding/watering them. Next spring we’ll buy young hens again! RancherMan & I are currently in the throws of an orchestrated decluttering of our home. Now we are pretty stringent with what we bring into the house. We don’t shop for shopping’s sake or to replace a perfectly good watzit with a new watzit of a different color. But occasionally we’ll make a sweep through the house and rid it of anything that’s no longer serving a purpose. Most of the time we bundle things up, document what was donated (for income tax purposes) and send it all to a thrift store. I’ve written before about how thrift stores are aligned with our values. But with a critical eye we wondered if some of those things could actually be sold for cold, hard cash. We recently had a tire blowout and had to plunk down some unexpected money to replace the tire. And the drought has the expense of caring for our animals quite a bit higher than expected. Why not try to recover a few bucks? So there are 5 Frugal Things we did this week that I could think of off the top of my head. And as you can see, many of the steps we take to be frugal are also gentle on the environment too. Win/win! 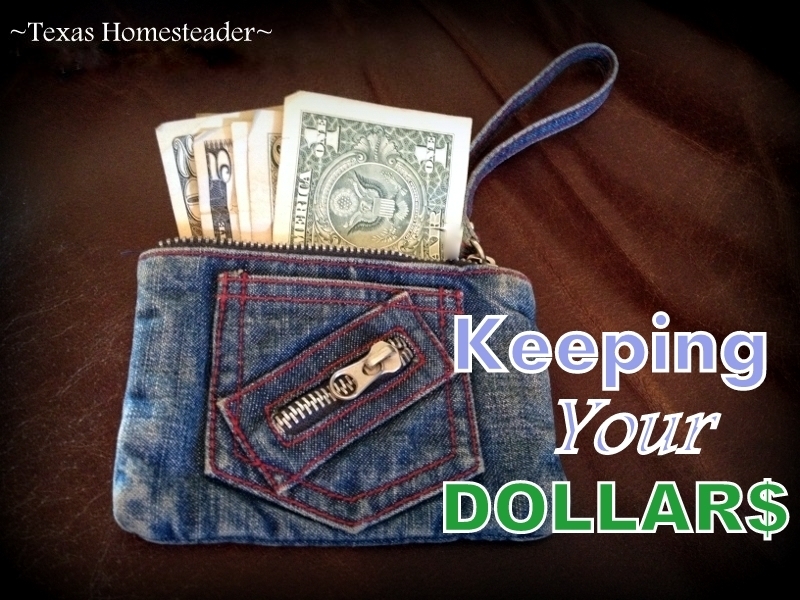 What are some ways you’ve saved money in your own household? 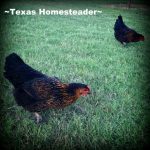 This entry was posted in Blog Posts and tagged Environment, Frugality on October 4, 2018 by Texas Homesteader. 1.) I, too, make yogurt and put it on everything. 2.) I save egg shells, boil them a couple minutes, let them dry, grind them up and feed them back to the chickens instead of oyster shells. 3.) I shred newspaper and junk mail, mix it with grass clippings and bed my chickens with it. My chickens free range as well.